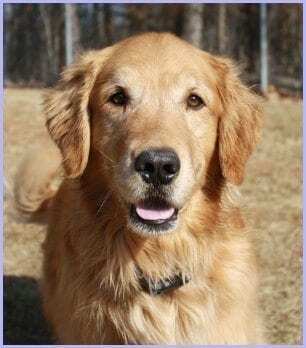 Lenny #5143 - Yankee Golden Retriever Rescue, Inc.
Four-year-old Lenny was brought to YGRR when his family became overwhelmed with the responsibilities of raising 4 kids under the age of 4. They loved Lenny and wanted him to get the care that they were unable to give him with all the demands on their time. Lenny was an active, affectionate boy and his owners knew he needed a home where he could get the attention and exercise he needed. Lenny was brought to our vet hospital and given a complete examination. He had a mild ear infection that was treated, and he was scheduled for a dentistry, as well. Lenny had some stomach trouble and was checked over to make sure he was okay, including x-rays to rule out an obstruction. Luckily, the x-rays were clear and he was soon feeling better. Once he had these health issues addressed, Lenny was on his to Riverview to get to know everyone. Lenny was a wonderful boy. He could hardly contain himself when meeting new people and would wriggle all over. He loved to play, especially with tennis balls. He loved to spend time in the play yards with the other dogs, as well. When spending time with staff and volunteers, he enjoyed all the attention and the occasional belly rub. 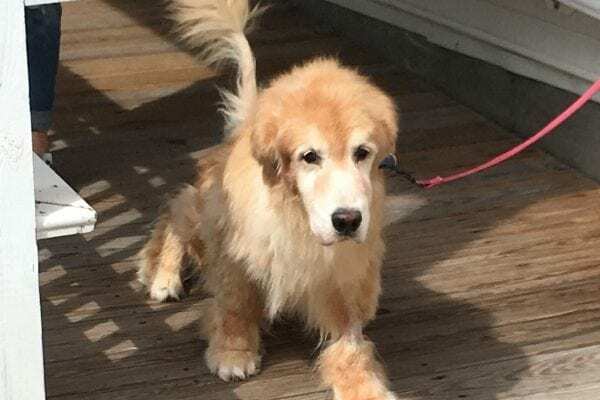 He had a very easy-going personality, though he was, of course, an active young Golden! Lenny now lives with a wonderful family that includes 2 human siblings. Lenny loves his new home and being showered with attention. He gets to go for daily walks or hikes with his family and spends very little time alone. Lenny’s adopters include Lenny in as many family activities as possible, which is just fine with Lenny! Lenny couldn’t be happier with his new family, and they in turn feel very lucky to be able to offer Lenny the type of home that this sweet boy deserves! Lenny thanks you for your support. No matter what their age, young or old, each dog that comes to YGRR gets whatever medical care is necessary. Lenny was fortunate that his stomach upset was mild, but no matter what the problem, we are committed to helping. Your donations make this level of care possible. We also carefully match each dog to the right home based on their individual personality. As a result, Lenny and over 5000 other Rescue dogs have gotten homes that are perfect for them. Lenny and all the Rescue dogs thank you and send big wags and kisses your way!